Accustomed as Americans were to the Spanish pieces, when discussions of a new monetary system for the United States began after the Revolutionary War, its architects were eager to preserve continuity between the old and the new in formulating their plans. Although Thomas Jefferson and Alexander Hamilton championed decimal coinage as a clean break with Europe's convoluted monetary systems, one concession to the Old World was made: The basic unit around which the new system revolved was the silver dollar, copying the Spanish coin's weight and fineness, along with its commonly accepted name. At the top of the new coinage scheme was the country's premier gold coin, the ten-dollar piece, intended by Congress' Mint Act of 1792 as America's face to the world, and symbolically designated the "eagle," after the national bird. Unfortunately, the eagle never served its intended purpose as the nation's gold coin for international trade. Bankers much preferred the half eagle, as it was closer in size to the widely recognized British guineas and sovereigns, the Brazilian 4000 Reis, and the French 24 Livres then in use throughout the world. But even the half eagles saw limited service in commerce, for Europeans hesitated to accept the unusual coins, favoring the more familiar issues of the day. To make matters even worse, as the price of gold rose with the turmoil surrounding the Napoleonic Wars, the undervalued (in relation to silver) U.S. gold coins rapidly disappeared into melting pots, many returning to the channels of commerce as new gold coins in an Old World guise. 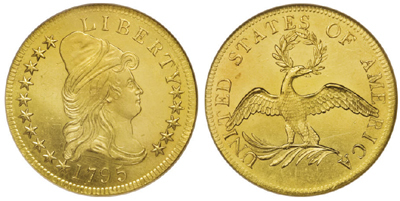 Because early U.S. gold saw little circulation, most surviving Capped Bust/Small Eagle tens are found in relatively high grades, generally from Very Fine to Almost Uncirculated. Mint state specimens are occasionally available, usually the 1795 issues, which appear much more frequently than the later dates of this design. The 1795 coins are often encountered with prooflike surfaces, including some amazingly well-preserved "gems"-apparently many were saved as first-year-of-issue souvenirs. Perhaps some of these exceptional specimens are from the group of 100 eagles presented by Mint Director Henry DeSaussere to President George Washington in October of 1795. The 1796 issue is considerably scarcer than the first year coins, particularly in mint state, but like its predecessor, several well-struck prooflike specimens have appeared on the market over the years. Eclipsing both dates is the very rare 1797 issue, quite elusive in all grades, with only a few mint state survivors known, including at least one prooflike example which appeared in Stack's sale of the famed Amon Carter collection in 1984. Although few present day collectors assemble sets of the seven varieties, it is by no means an impossible quest except in high grade, as the rare 1797 and 1795 nine-leaf reverse issues become prohibitively expensive. Most collectors pursue only a single example of this design type. Curiously, a collection of just the three dates could be construed as a minor "type set" within the series, as they each have a different arrangement of stars on the obverse. When grading this design, obverse wear first shows on Liberty's hair, cheek, shoulder and cap. On the reverse, check the eagle's wings, breast and left leg. A caveat, however: These coins were produced with manual presses and suffer from the unpredictable striking quality common to many early coins. What looks like wear on one coin may be only a loss of detail, while another coin with sharper details may in fact have more wear, and thus be in a lower grade. Additionally, adjustment marks from the filing of overweight planchets routinely plague all early U.S. gold. While these marks are mint-made defects, they don't necessarily affect the grade, but can often affect the value of a coin, depending on whether the marks are unsightly or barely noticeable. Scot replaced the small eagle reverse in mid-1797 with the new Heraldic Eagle design, modeled after the bird on the Great Seal of the United States. The Capped Bust motif remained on the obverse until 1804, when President Jefferson halted production of both gold eagles and silver dollars. The eagle would not return until 1838, when it featured an entirely new design, Christian Gobrecht's Coronet Head Liberty.